Disclosure: I received Nixall products for review purposes only. All opinions are my own. It took me having kids to really think about the ingredients in the products I use in and around my home. More and more I am researching and turning to non-toxic products, including items for cleaning and most definitely for first-aid. 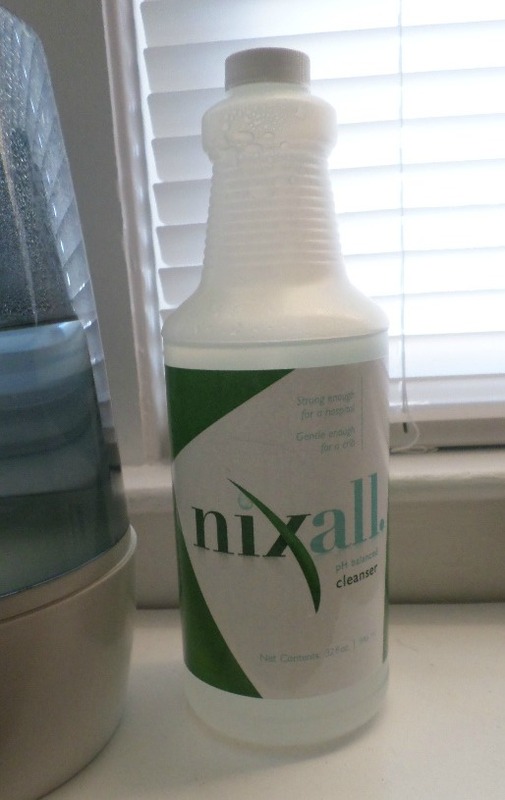 I have been using a new product for me: Nixall Cleanser, a non-toxic cleanser that contains no harsh chemicals. It is safe for our hands, (no awful rubber gloves needed to clean with this product.) perfect for bathrooms, even safe for use on changing tables. It is also great in the kitchen, as it is safe around food and food prep surfaces. 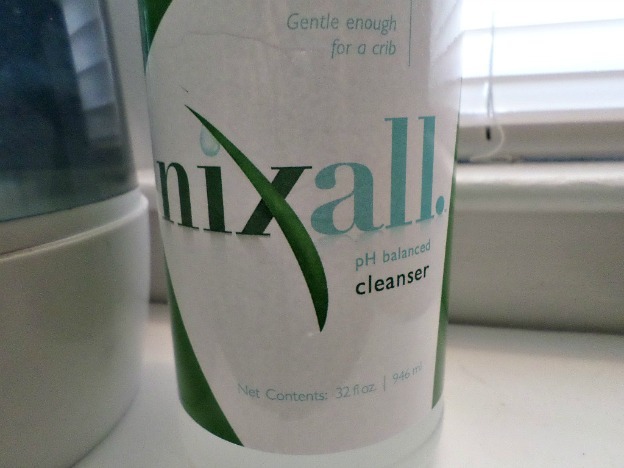 Nixall Cleanser: all-natural electrolyzed, oxygenated water that contains hypochlorous acid, a naturally occurring molecule of the human body. Have you ever thought about cleaning your humidifier? I hadn't, I had cleaned the surface and the independent pieces on the outside, but the inside? Not a thought in my mind. I had used lavender oil as an air freshener, but then wondered if it would do more harm than good. So I tried Nixall. Nixall suggests adding a cup and a half of its cleanser into the humidifier each time it is filled. This will clean the stale mildew air and leave the room fresh and deodorized, while also cleaning the inside of the humidifier. Nixall Cleanser will send out a vapor containing hypochlorous acid. The suggested dilution: 10:1 or 5:1 ratio. 5 to 10 parts water to 1 part Nixall. According to Wikipedia: "Hypochlorous acid is a weak acid with the chemical formula HClO. It forms when chlorine dissolves in water, and it is HClO that actually does the disinfection when chlorine is used to disinfect water for human use. It cannot be isolated in pure form due to rapid equilibration with its precursor. HClO is an oxidizer, and as its sodium salt sodium hypochlorite, (NaClO), or its calcium salt calcium hypochlorite, (Ca(ClO)2) is used as a bleach, a deodorant, and a disinfectant." We also tried a sample of their First-Aid spray. A great spray to throw in your camping bag, overnight bag or purse, perfect for all minor mishaps like cuts, scratches, sunburns and blisters. Nixall has many family and animal products with multiple uses for you and your family to try and use with peace of mind. Enjoy a 25% off coupon code with: NIX25. FREE SHIPPING with every order. G+: +NixallSolutions * Nixall® does not claim to heal, treat or cure any disease, or injury. Nixall's OTC Wound+Skin solution is a hypochlorous acid solution to be used in the home, as directed on the label and should not be used in place of medical adivce.